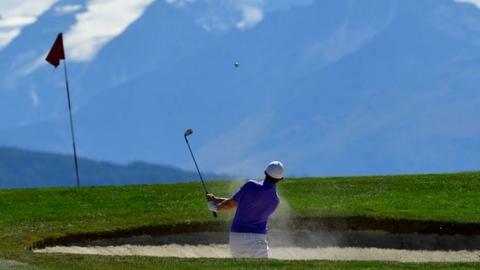 -17 M Fitzpatrick (Eng)*, L Bjerregaard (Den); -15 M Lorenzo-Vera (Fra); -12 N Elvira (Spa); -11 D Brooks (Eng). Selected others: -7 L Westwood (Eng); -6 L Canter (Eng), R McEvoy (Eng), C Shinkwin (Eng). England's Matthew Fitzpatrick claimed a fifth European Tour win after edging out Denmark's Lucas Bjerregaard in a play-off to defend the Omega European Masters title in Switzerland. Fitzpatrick birdied the first play-off hole after finishing level with Bjerregaard at 17 under after 72 holes. Bjerregaard carded a final round seven-under 63, with Fitzpatrick making a birdie at the last for a 67. France's Mike Lorenzo-Vera (67) finished third, two shots off the pace. Fitzpatrick, 24, became the first player since Seve Ballesteros in 1978 to successfully defend the title at Crans-sur-Sierre Golf Club. The world number 44 had entered the final round with a two-shot lead over Lorenzo-Vera after carding a bogey-free third round of seven-under 63. "It was really tough, of all of my wins this was the most difficult," Fitzpatrick said. "I didn't have my A game today, despite loving this place I just didn't play my best today. I managed to grind it out, made some crucial birdies coming in and I'm delighted. "This is one of my best."